USA TODAY Sports’ A.J. 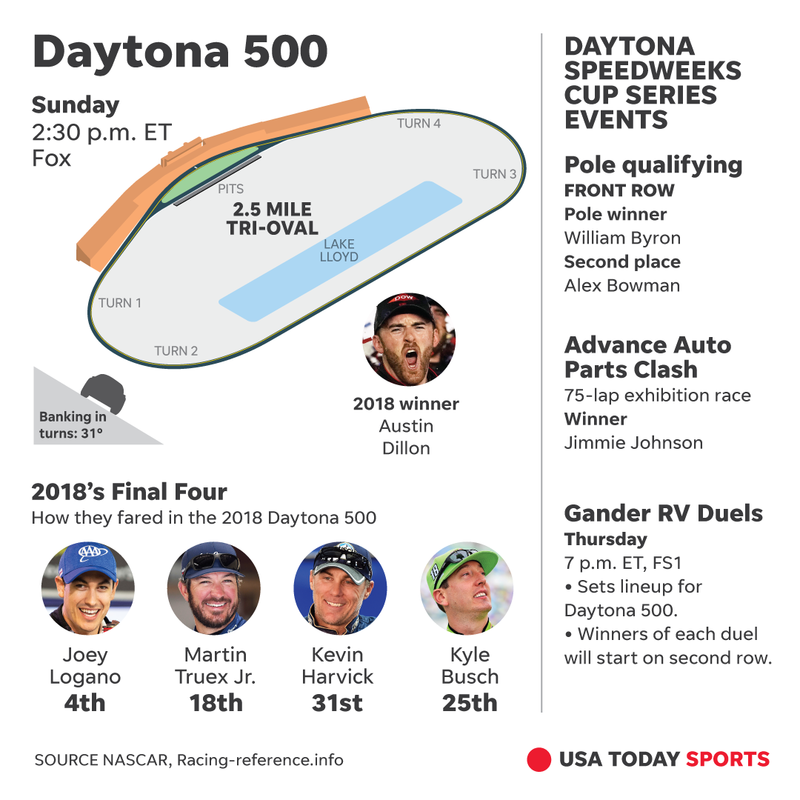 Perez looks to the Daytona 500 and the five drivers that racing fans should keep their eye on this Sunday. DAYTONA BEACH, Fla. – Brian France’s name only appears twice in the current NASCAR Monster Energy Cup Series media guide, both relating to taking over leadership of the series from his father in 2003. There’s not much detail provided in the 502-page book as to why he’s no longer in that position. “Jim France assumes the role of NASCAR Chairman and CEO and Steve Phelps is named the President of NASCAR, becoming just the fifth different president of the sport,” the guide reads in describing the September 2018 shift of power atop the most powerful racing organization in North America. Brian France took an indefinite leave from his role as NASCAR chairman and CEO after his arrest in August for driving while intoxicated in New York and his uncle, Jim France, was giving the interim tag. That designation, however, has become more permanent. “Jim is Chairman and CEO,” NASCAR spokesperson Eric Nyquist told USA TODAY Sports on Wednesday. The designation — even if it was termed as temporary for the last several months — has been welcomed by many within the sport. Brian France, who had served as NASCAR chairman and CEO since 2003, was never as visible as his father, Bill France Jr., who attended virtually every race and was a fixture in the infield when he ran the sport from 1972-2000. Jim France’s reign is a throwback of sorts to when his brother — and father, NASCAR founder Bill France Sr. — led NASCAR. “I think Jim has done a tremendous job of at least being around,” Joe Gibbs Racing driver Kyle Busch said. “He’s always carrying a pen. He’s always carrying a notebook, he’s always taking notes, he’s always listening to people. Kurt Busch, who will make his debut at Chip Ganassi Racing at Sunday’s season-opening Daytona 500, said he was “inspired” at a meeting he and other former champions had with Jim France in September to launch the KB100 Ticket Giveaway, which gifts 100 tickets to current and former military members this season. Brian France got knocked for not attending races, although he went to roughly half of the Cup races each season. While he may have lacked an on-track presence, he’s known as a dogged negotiator. France is credited with landing lucrative television deals, including the current $8.2 billion, 10-year deal with NBC and Fox. France was arrested for DWI and unlawfully possessing a controlled substance in Sag Harbor, N.Y., in August. The next hearing in the case at the Sag Harbor Justice Court is scheduled for April. With Jim France and Phelps in charge, NASCAR has made several changes this offseason. There’s a new aero package as the series again attempts to increase downforce, which — in theory — could lead to better racing, especially on intermediate tracks. A new car also is in the works that is slated to debut in the 2021 season. Sunday also will mark the debut of a new post-race inspection process in which a winner won’t be announced until the car has cleared, which is expected to take about 90 minutes. Kevin Harvick would have been stripped of two wins if such a system were in place last year. Seven-time champion Jimmie Johnson told USA TODAY Sports that many of the changes announced of late were probably in the works under Brian France. “For as much change is going on, there has been a plan and a vision that’s been more than six months in the making,” Johnson said. “Absolutely, it could have been sped up (with Brian France’s departure). It could have been altered a few degrees here and there. The “what’s next” for Brian France also has been tough to decipher. He kept a low profile during much of his time as NASCAR top executive, outside of series finales and annual awards shows. France did attend the funeral for J.D. Gibbs, the president of the racing team owned by his father, legendary Washington Redskins coach Joe Gibbs. J.D. Gibbs died in January after a lengthy battle with a neurological disease. There’s some thought among those close to NASCAR that France could have some role in trying to turn around NASCAR’s flagging television ratings, given his background. France still is listed on International Speedway Corp.’s board of directors. NASCAR launched an effort in November to acquire ISC, the publicly traded race track giant that was started by Jim France Sr. and currently is run by Brian France’s sister, Lesa France Kennedy.